This Graduate Student Handbook describes the policies, requirements and guidelines for the Graduate Program in Microbiology and has been formally agreed upon by the faculty of the Department. This handbook constitutes a contract between the student and the faculty when the student enters the Graduate Program (acceptance of offer), and that handbook edition applies for the duration of the Graduate Student's tenure at the Department. The Microbiology Graduate Program operates within the University’s regulations as described in the Graduate School Bulletin and the Graduate Student Handbook. These publications are issued by the Graduate School and the Graduate Dean’s Office, respectively, and students are expected to be familiar with relevant regulations. The Department’s Graduate Program Director (GPD) is also available for consultation concerning any aspect of the program. For incoming PhD students, first semester begins with a teaching assistantship, and two rotations are mandatory for the first two full semesters. A listing of currently offered rotation projects is provided to all students prior to the semester, and includes both research themes and associated techniques for each rotation. A rotation project lasts for one semester. A third rotation is optional. Rotations are taken for credit, and will be evaluated as pass/fail. During the rotations the Guidance Committee offers advice to students on which courses to take. At the time of first registration, a member of the faculty is assigned as rotation advisor for each PhD student by the GPD after a discussion with the students. Rotations provide first-semester students exposure to the different research groups to determine favored areas of research and compatibility with advisor and research group. We encourage students to consider rotating through 2 or 3 laboratories before deciding who their PhD advisor will be. Rotation students should join a lab by the end of their final rotation and are encouraged to seek a lab with research funding support. The advisor must be a member of the Department of Microbiology, although adjunct professors may serve as advisors. Adjunct professors are not guaranteed TA support by the Department of Microbiology. Should the student change dissertation advisor, the new advisor becomes the faculty advisor for the student, and a new research program is begun. Laboratory and Fire Safety Training is required for faculty, staff, and students, graduates and undergraduates, post-doctorates and visiting scholars before initial assignment to a laboratory. This requirement can be satisfied by attending a two-hour seminar. This seminar includes one hour of Laboratory Safety Training, one-half hour of Hazardous Waste and one-half hour of Fire Safety Training. Environmental Health and Safety (EH&S) will schedule at least one session monthly. Check the EH&S Laboratory and Fire Safey Training Schedule for upcoming times and locations. Fire and safety training has to be updated annually in an online session provided by EH&S. PhD students are normally admitted to the Microbiology Graduate Program only if they have financial support as approved by the Department. For most students, this support takes the form of an assistantship provided by the Department, and in general we support all PhD students on an assistantship. Initially such support is in the form of a teaching assistantship, then later in the program students are typically supported on research assistantships provided by faculty research grants or contracts. Some students are supported by external sources, such as government scholarships, foundation stipends, or by assistantships from other University-based sources outside the Department. The selection of research assistant appointments, terms of contract, and other details of such appointments fall entirely within the purview of the faculty member who is the principal investigator on the grant, subject to Department and University regulations. PhD students appointed as teaching or research assistants may not, in general, accept concurrent employment elsewhere. Exceptions must be approved by both the GPD and the dissertation advisor prior to acceptance of any other type of employment. Concurrent employment is strongly discouraged by the Department, and students should note that there are University regulations governing the number of hours that a student may work (see the University’s Graduate Student Handbook). Students appointed as teaching or research assistants are governed by the conditions of the agreement between the University and the Graduate Employee Organization (GEO). Teaching assistant appointments include the January intersession period. Details of public holidays, personal leave, and vacation entitlement can be found in the Graduate Appointment Policies and Procedures document issued by the Graduate School. Prior to conducting any work in a research laboratory, PhD and master's students must undergo safety training as prescribed by the University’s Environmental Health and Safety Office and provide documentary evidence of the satisfactory completion of this training. All students are required to have an OIT Email account, even if they already have an account created with our Department. The OIT account has to be activated to enable registration via SPIRE, however students may forward all email messages from the OIT account to an account that they use regularly. The OIT account allows the Graduate School to send official email notices to all students. Graduate teaching assistantships are an important component of our dissertation level graduate education process. They provide the student with valuable experience as an instructor at the collegiate level and develop in them organizational, speaking, and technical skills. Furthermore, assistantships provide the student with the financial means necessary for them to attend graduate school. The faculty charged with responsibility of the course will provide opportunities to the graduate student assisting in the laboratory for laboratory preparative duties, teaching, and preparation of grading of examinations. The following are guidelines for awarding teaching assistantships. All new students in our PhD program funded by a teaching assistantship are recruited into the Department and not to a specific faculty member. Each student will generally qualify for two semesters as a teaching assistant as long as their performance is sufficient during their first teaching semester. They will also be supported by the Department to work with a faculty member during the summer following their first academic year. Faculty advising students who need a reappointment beyond two semesters should notify the Graduate Program Director by February 1. All dissertation level graduate students in our program are required to teach one semester with financial support for that semester. However, students may be required to teach two semesters in one year to satisfy a full academic year teaching contract unless other arrangements can be made. Note that this does not include Master’s level graduate students (regular and 5th-year Master’s). The criteria for teaching assistantship reappointment will include a minimum overall GPA of at least 3.0, satisfactory performance and progress reports from the rotation advisors and course instructors who supervised the student, length of time on teaching assistantship, and length of time in the degree program. In general, we support all students in our PhD program on a teaching assistantship or a research assistantship. To qualify for consideration of additional teaching assistantship support after two semesters of teaching, the faculty advisor and graduate student should demonstrate that a serious effort has been made to obtain alternative funding. If a suitable effort has not been made to obtain funding, then the student should transfer to an alternate laboratory where research funding is available or consider leaving the program. Graduate teaching assistantships will generally be awarded for an academic year (i.e., fall and spring semesters). In general, teaching assistantships, whether awarded to one of our current students or a new recruit, should not be considered renewable unless extenuating circumstances can be justified. Examples include a shortfall of students to meet our teaching needs or a short-term lapse in research funding on the part of a faculty member. The GPD and Department Head are responsible for assigning teaching assistantships to specific courses. Consideration will be given to the special needs of the instructor and qualifications of the student when appropriate. All graduate students are required to register for the graduate seminar course MICROBIO 791A, which is a one unit course offered every semester. A student must take at least 9 credits per semester in order to maintain full-time status (see list of graduate-level Microbiology courses in Appendix 1). Credits transferred from another institution cannot be used to satisfy the University's requirement for graded credits nor the 600-800 course level requirement. Graduate courses which have been applied toward any baccaulaureate or advanced degree may not be used for fulfilling requirements for any other master's degree at the Universty. Students are strongly encouraged to enroll in a journal club each semester after their first year. A minimum of 30 graduate credits and completion of a graduate research project are required for a master’s degree. Twenty-one credits must be in the student’s major field and a minimum of one-half of the total required credits must be on a letter-graded basis. Any portion of the remaining credits may be graded satisfactory subject to prior approval by the department. Students must fill out the Master’s Degree Eligibility Form and obtain the appropriate signatures prior to receiving the degree. Students must check with the Graduate School for deadline dates. Master's students who write a thesis cannot count more than 10 thesis credits (MICROBIO 699) toward the Master’s degree. The number of Independent Study credits is limited to 6 for the duration of the Master’s program. Excluding thesis credits, graduate students must earn an additional 6 credits in the 600-800 course level range. Graduate students who do not write a Master’s thesis (e.g., 5th year Master’s students) must earn a minimum of 12 credits in the 600-800 course level range. All students are required to undergo a general examination on their research topic. The examination will be conducted by the student’s advisor and two additional members of the Department. Thesis option students must form a thesis committee that shall consist of one or more members of the Graduate Faculty recommended by the GPD and/or Department Head. All members should have at least adjunct status within the department. A thesis committee has been officially constituted when the Graduate Dean sends formal notification of its formation to all members, the GPD and the student. A thesis option master’s candidate must prepare a suitable thesis outline to be approved and signed on the cover sheet by each member of the approved thesis committee and the GPD or Department Head. The signed copy of the thesis outline is forwarded to the Graduate Records Office for inclusion in the candidate’s file at least 4 months prior to the date that the thesis defense is scheduled. The thesis must be typed in the format prescribed by the Graduate School. The thesis must be approved and signed by all members of the thesis committee and the Department Head. The electronic submission of a Master’s Thesis is available but voluntary. For complete information on Graduate School requirements for preparing and submitting the thesis by paper or electronically, refer to the Graduate School document Master's Degree Requirements and Thesis Information. In their first two years, students will typically take two instructional courses with an emphasis on qualification courses (see below). All graduate students are required to register for the Graduate Seminar course and give one presentation to the Department each academic year starting in the second year and excluding the year of the final defense. The remaining credits are filled with independent study. This latter course typically ranges between 3 and 5 credits per semester and is arranged between the student and their research advisor for that semester. Registration for Independent Study requires the signature of the advisor on a Course Override Form available in the main office. The Graduate School requires no minimum number of credits for the doctoral program, with the exception of dissertation credits. However, we recommend that all graduate students meet the credit requirements for the Master’s degree in case a student leaves the program with a Master’s degree. A doctoral candidate must have 18 dissertation credits in order to receive the Ph.D. degree. Dissertation credits are taken by the candidate only after the Preliminary Comprehensive Examination has been passed. ** Note that audited and dropped courses cannot be included in status calculations. Students enrolled in the Ph.D. program are considered doctoral students. Candidacy is recommended for doctoral students by the Department upon satisfactory completion of both, coursework and passing the Preliminary Examination. After the Preliminary Examination students enrolled in the Ph.D. program are considered doctoral candidates, and thus eligible to receive the degree of Ph.D. Courses in these areas are offered every 1-2 years so students should plan accordingly. Students are expected to qualify in their three core course areas by the end of the Spring Semester of their second year, although exceptions can be made if the student receives permission from the GPD or the Department Head. Requirements for qualification vary with the instructors, but all courses in which a student qualifies count towards the three cores areas. Certain highly intensive laboratory courses can count as a core area fulfillment, however the decision rests with the instructor. Certain courses outside the Department can also be taken, however only upon agreement with the respective faculty members within the Department of Microbiology and the GPD. Within the first semester the students are offered an informal and brief guidance meeting with the Department Guidance Committee. This committee consists of the GPD, the Department Head, and two experienced faculty members. About one week prior to this meeting new graduate students will provide the GPD with a one page sheet indicating background, interests, research and other plans, and course choices. Proficiency in three areas of microbiology (qualification in three core areas). The ability to propose a novel and important research project in microbiology and adequately describe and defend the means by which this project would be conducted and completed. The exam will be administered by a committee composed of three Microbiology faculty members. Adjunct faculty members cannot be a committee member for this exam. The committee members will be selected by the student, their advisor, and the GPD or the Department Head. The student’s advisor may not serve on their committee but may attend the exam as an observer. The three committee members generally represent the research interests and expertise of the student and the areas of microbiology in which they choose to be examined. Each committee will select a chairperson from among its three members who will write a brief summary of the exam and the findings of the committee for the GPD. The exam has both written and oral components. The written portion culminates into a research proposal that is accomplished in stages so that the student’s committee can monitor the progress of the student. Students are encouraged to discuss the outline of their proposal with their committee prior to its submission. It is left up to the individual committee members to decide how much review of the proposal they are willing to provide prior to the examination. After completion of the proposal, the committee will determine whether the student is prepared for the oral portion of the exam. The oral exam is conducted by the committee members and will focus on, but not be limited to, the three areas of microbiology chosen by the student. If a student has already qualified in two core areas, but has to postpone qualification in the third core area to the following Spring semester due to scheduling conflicts, the preliminary examination can be held prior to completion of the third core qualification with the consent of all three committee members and the GPD. Students propose research that is related to their own research projects but must be distinct from the specific research proposed by their advisor to demonstrate originality in thinking. An example would be that a student develops hypotheses that are in support of the current research project of the advisor, but can exist by themselves to produce a novel research project. Students may seek the advice of their advisor, the GPD or the committee chairperson about their proposal, but their involvement must be minimal during the development of the proposal to ensure that its originality belongs to the student. The work proposed should be original and reasonably performed by the researcher and two hypothetical graduate students over a three year period. a) One page summary of proposed project that is non-technical, introduces the topic and states the major objectives, how they will be accomplished and the relevance of the results to the field. Students should consult the NSF and NIH proposal guidelines for more details and meet with their committee members prior to writing their proposal to discuss their topic and immediately following the completion of their proposal. Preliminary results from laboratory research may be used in the proposal to demonstrate the technical capabilities of the student. Students have to submit their proposal to their committee two weeks prior to their anticipated oral examination, but it is highly recommended that the graduate student engages in proposal related discussions with committee members prior to this date. The oral portion of the examination will consist of an oral presentation by the student that briefly summarizes the goals, methods, and expected results of the proposal followed by a question-and-answer period involving the student and the committee. Questions from the committee will focus primarily on the proposal from the student but may also include questions that expand into the student’s core areas of study. The advisor can witness the preliminary exam but only as a silent member. It is highly recommended that the students practice by preparing a test run of their proposal presentation in front of their peers. Participation of committee members is not allowed in a pre-examination presentation. Pass: the student has successfully completed all aspects of the examination. Re-examination: the committee has found that the student has not completed some aspect(s) of the exam in a satisfactory manner and the student will need to retake the exam. The committee will make recommendations on how the student should prepare themselves for areas in which they were not proficient (e.g., course work, reading material, etc.). A re-examination will be more stringent than the initial examination. Fail: the student has not completed the exam successfully and is not given the option of retaking it. If the student is given the option of re-examination, then they will have one more opportunity to satisfactorily complete the examination as recommended by the committee. This must be done within six months from the date of their first exam unless granted permission by their committee. If the student does not pass the exam on their second attempt, then they will have until the end of that academic semester or up to six months to complete work within the Department. This will be decided upon by the student, their advisor, the GPD and the Department Head. If the comprehensive exam is the last item prior to candidacy, the candidacy form will suffice to alert the Graduate School that the student has passed the exam. Upon successful completion of the Preliminary Comprehensive Examination, the Doctoral Dissertation Committee is appointed by the Graduate Dean upon nomination and recommendation by the GPD or Department Head. The Committee is composed of at least four graduate faculty members: the chairperson – a member of the Department, two additional members from the Department of Microbiology, and one member from “outside” the candidate’s department or program, who is a faculty member from UMass or Five Colleges and has Graduate Faculty Status. Adjunct faculty members in the Department of Microbiology can serve as the chair of the dissertation committee. The committee has been officially constituted when the Graduate Dean sends formal notification of its formation to each committee member, the GPD, and to the graduate candidate. Members of the Dissertation Committee must agree to not only assist in the supervision of the dissertation project, but also conduct the Final Oral Examination. Selection of the committee is a matter of “academic judgment” which should be made by the GPD, the Department Head and/or the advisor, and approved by the Graduate Dean. Candidates should be reminded that most of the faculty are on nine-month contracts and should not necessarily assume that committee members will be available during the summer months. While not recommended, it is acceptable to have a Dissertation committee member participate via video conference. After successful completion of the preliminary examination, Graduate students become dissertation candidates. Candidates are required to meet with their Dissertation Committee at least once within a 12 months period. It is highly recommended that the candidate prepares the first committee meeting with the dissertation committee shortly after the preliminary examination, i.e. within less than a 12 month period (we recommend after six months). 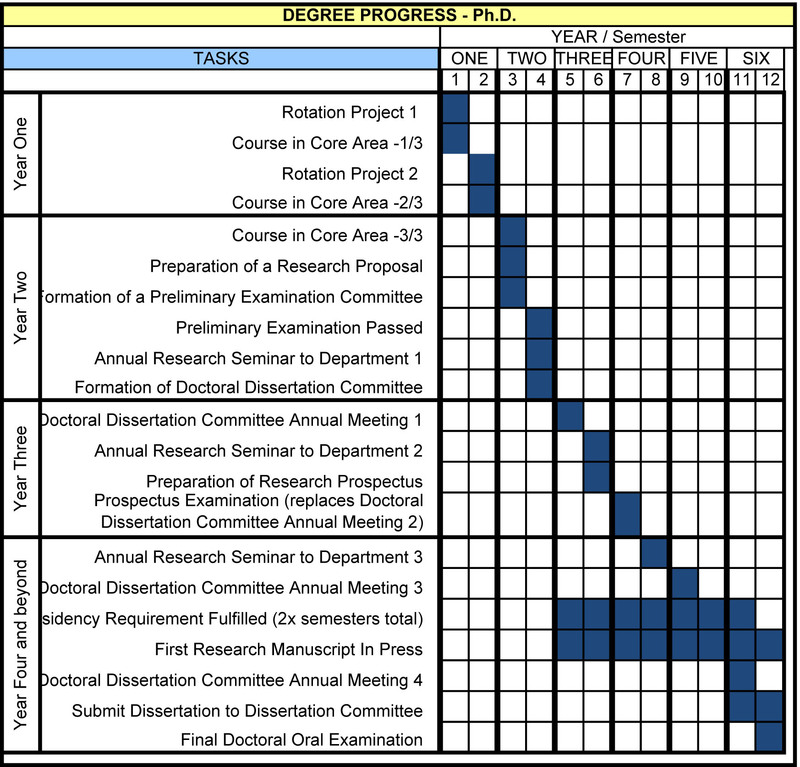 In the meeting with the dissertation committee the candidate is encouraged to outline his or her dissertation progress, and show a timetable of ongoing and future work needed to complete the dissertation. The purpose of the committee in these meetings is to provide guidance and feedback on the candidate’s research and Department requirements (i.e. publication requirement, residency requirement) towards the completion of his or her dissertation (see Appendix 2 for additonal advise). Failure to hold the annual dissertation committee meeting might jeopardize the travel support provided to candidates by the Department. Once a year, usually following the committee meeting, the main advisor of the graduate candidate has to prepare a brief Annual Graduate Student Progress Report. This report is signed by the graduate student, and submitted to the GPD. After passing the Preliminary Comprehensive Examination, the graduate degree candidate must prepare a dissertation prospectus describing the research to be conducted, analyzed, and presented in the dissertation. The cover sheet must be signed by each member of the Dissertation Committee to indicate approval of the topic and its plan of execution. The GPD or Department Head signs and forwards the prospectus to the Graduate Records Office. A copy of the signed cover sheet must be submitted to the Department of Microbiology Office. The Graduate School requires that this copy must be received at least 7 months prior to the Final Oral Examination. However, the Department of Microbiology strongly encourages candidates to complete their prospectus by the end of their third year. A one page summary of the dissertation project that introduces the topic, the overall goal of the project, and states the specific aims of the dissertation and the relevance of the results to the field. The research design and methods to be used. Preliminary results and their interpretation that demonstrate the feasibility of the project. Future experiments necessary to complete the project. Literature relevant to the prospectus text. A list of publication titles proposed as the outcome of this research. A detailed research plan and time line of events leading to the completion of the dissertation. It is essential that the proposed research will be performed primarily by the candidate. The Prospectus should be reviewed by and discussed with the candidate’s advisor prior to submission to the Dissertation Committee. The Prospectus should be distributed to the candidate’s committee at least 2 weeks prior to their anticipated meeting. The Prospectus is a formal summary of existing and proposed research, and not an examination. It is either approved or not approved by the Dissertation Committee. The result of the Prospectus Defense is forwarded to the Graduate Records Office directly following the approval by the Dissertation Committee. A doctoral candidate, a student who successfully passed the preliminary comprehensive exam, must fulfill the Residency Requirement. The Graduate School's residency requirement is fulfilled by taking two consecutive semesters of full-time enrollment of MICROBIO 899—Ph.D. Dissertation (nine credits per semester) in residence at the University. The residency year must be either in a Fall/Spring or Spring/Fall sequence. During this year, the student must spend some part of each week physically on campus. Doctoral students enrolled in recognized off-campus programs may satisfy this regulation at their off-campus site. The Doctoral Residency Requirement is based on the expectation that degree recipients should at some point have a significant interaction with members of the graduate faculty of their program. Graduate candidates are not required to register for the Graduate Seminar course during the residency year. The Department of Microbiology requires that the candidate has at least one first-authored manuscript published or ‘in press’ in a professional peer-reviewed journal from their dissertation research prior to the scheduling of the candidate’s Final Oral Examination. Authorship decisions will follow the criteria for authorship credit of the International Committee of Medical Journal Editors. To be included in the list of authors a contributor’s involvement must meet the following three conditions: (a) Concept and design, or analysis and interpretation of data, (b) Drafting or critical revision for important intellectual content, (c) Final approval of the version to be published. The oral examination will be in two parts: a seminar presenting the dissertation research results to the campus at large followed by a closed session with members of the dissertation committee. All Final Oral Examinations/Dissertation Defenses must be announced in the weekly bulletin of the UMass Website (www.umass.edu/loop) to allow interested graduate faculty and others to attend. The Office of Degree Requirements must receive written notification of the scheduling of a Final Oral Examination at least 4 weeks prior to the date of the defense. An examination cannot be held unless it has been publicly announced. The examination must be held on the Amherst campus. All members of the Dissertation Committee must be present at the defense. Following the public presentation of the dissertation, the candidate will meet in closed session with the members of their committee to answer questions related to the dissertation. Normally both parts of the Final Oral Examination will take place on the same day. The result of the Final Oral Examination is forwarded to the Graduate Records Office directly following the examination. All dissertations have to be submitted electronically. While it is no longer a requirement of the Graduate School, the Department of Microbiology requests a hardcopy of the final dissertation. The dissertation must be typed in a prescribed style and format on acid-free paper. The dissertation must be approved and signed by all members of the dissertation committee and the Department Head. The Graduate School is the final and only arbitrator of what is an acceptable dissertation. For complete information on Graduate School requirements for preparing and submitting the thesis by paper or electronically, please refer to the Graduate School document Doctoral Degree Requirments and Dissertation Information. The University and the Department believe that the primary responsibility for successful completion of the degree lies with the candidate. All candidates are expected to advance towards their degree as expeditiously as possible while maintaining academic excellence. They are expected to pursue research-related activities year round. Progress is monitored by the GPD in consultation with the candidate’s advisor and their committee. Graduate candidates who are not making satisfactory or reasonable progress toward the completion of their degree program are subject to termination. Satisfactory progress to remain in good standing within the graduate program includes a) maintaining a grade point average greater than or equal to 3.0, b) completion of the various requirements of the program by their deadlines (details of which are herein), and c) maintenance of continued progress in research. Failure to make satisfactory progress may, depending on the circumstances, result in transferal from the Ph.D. to M.S. program or termination of studies. Upon the recommendation of the GPD and the approval of the Dean of the Graduate School, candidates will be notified of any formal termination by the Graduate School. The statute of limitation for doctoral candidates is six years for students joining the Graduate Program with a Bachelors degree, and four years for students joining the Graduate Program with a related Masters degree. For new doctoral students starting in Summer 2009 or later, the statute of limitation is set at six years prior to achieving candidacy and five years once candidacy is achieved. Candidacy is recommended upon satisfactory completion of coursework and passing the Preliminary Examination. In the rare event that an extension is necessary, extensions of the statute of limitation will be decided by the GPD and the Department Head, and two-year extensions will be considered upon recommendation submitted to the Graduate School by the GPD. MICROBIO 552 Pathogenic Bacteriology Laboratory (Fall). Laboratory procedures in clinical and diagnostic bacteriology including: i) culture and physiological characteristics of the pathogenic bacteria; ii) recommended procedures for the cultivation of both the common and rare pathogens isolated from clinical material; iii) conventional and rapid biochemical methods for detection and identification of medically important bacteria; iv) serological procedures on microorganisms of prime medical concern; and v) prescribed tests for the susceptibility of bacteria to antibiotics and antimetabolites. 3 credits. MICROBIO 562 Environmental Biotechnology. Microbial Biotechnology is a laboratory course supported by lectures and demonstrations. This advanced course is designed to introduce graduate level students to traditional and molecular methods strategically applied to problems related to microbial biotechnology and environmental microbiology. Course topics cover a wide range of subjects from the diversity of microbial life to biodegradation. Seven general areas are emphasized: (1) Statistical sampling and chemical and physical site characterization, (2) biomass determination and cell counts, (3) enrichment techniques, (4) microbial activity measurements, (5) single cell detection in situ, (6) sequence analysis and phylogenetic analysis followed by probe design, and (7) other modern techniques of environmental microbiology. 3 credits. MICROBIO 565 Laboratory in Molecular Genetics (Fall). Methodology and principles of modern molecular genetics. Microbial genetics combining classical techniques with bacteriophages and bacteria with modern PCR and recombinant DNA experiments. Introduction to genomic and structural analysis using computer methods. Gene expression in insect tissue culture cells using the baculovirus gene expression system. Designed to help students learn techniques and analyze results. 4 credits. MICROBIO 570 Virology. Molecular biology of animal viruses and viral genetic systems; viral disease processes. Emphasis on polio virus, influenza, herpes viruses, the DNA tumor viruses, retroviruses (including HIV), and hepadna viruses. 3 credits. MICROBIO 585 Concepts in Molecular Genetics (Spring). Fundamental and advanced concepts in bacterial gene regulation, with focus on bacterial responses to environmental stress. Emphasis on experimental design, data interpretation and presentation. 3 credits. MICROBIO 590S Parasitology (Spring). Classical and modern parasitology concentrating on protozoan and worm parasites of major medical/veterinary importance. Topics include basic principles of parasitology, life cycles, epidemiology, host-parasite interactions, drug treatments and vector control programs, along with information on the basic biology, biochemistry, and genetics of selected parasites. Prerequisites: introductory course in biology; BIOCHEM 285, MICROBIO 310. 3 credits. MICROBIO 590L Parasitology Lab (Spring). Interdisciplinary discovery-based laboratory in which students perform individualized experiments. Students use the genetic tool RNA interference to validate potential new drug targets in the protozoan parasite, Trypanosoma brucei. specific techniques include: database searching, primer design and PCR analyses, DNA andRNA isolation, culturing and transfection of eukaryotic cells, inducible RNA interference, epifluorescence analyses, and drug inhibitor studies. Corequisites: MICROBIO 590S or consent of instructor. 3 credits. MICROBIO 597B Microbial Biotechnology. Agricultural and industrial uses of microorganisms and efforts to genetically modify microorganisms for specific purposes. Topics include: history and development, microbial products, microbial biomass as a protein source, bioremediation, N2 fixation, Agrobacterium and the manipulation of plant genes, detection and monitoring of genetically engineered microorganisms, government regulation and social implications. Prerequisite: Course in genetics desirable. 1-3 credits. MICROBIO 597E Environmental Microbiology (Spring). How Microorganisms interact with each other and with their environment. Microbial distribution and activities in natural systems, and their importance to ecosystem function and environmental quality. Extreme habitats; habitat-specific forces; microbial activity; microbial transformations and their impact on different environments; species diversity, detection, and control of microorganisms; and associations with higher organisms. Each basic principle followed by applied and environmental case studies. Modern techniques of environmental microbiology graduate students write an independent research proposal. 3 credits. MICROBIO 660 Genomics and Bioinformatics (Spring). Society will realize greater benefits from the genomic revolution when we can effectively synthesize a comprehensive understanding of a biological organism’s physiology and health using genomic data. This course introduces fundamental concepts and tools in genomics and bioinformatics to provide students with a foundation for doing innovative research. The course emphasizes the strong interdependence of genomics and bioinformatics. Genomics produces large scale data sets that require bioinformatic methods for data storage, manipulation and analysis. Neither could produce meaningful results without the other, yet they are traditionally placed in separate disciplines. By teaching both approaches together, this course will give students the ability to formulate genome-related hypotheses and provide the practical skills for solving the closely interlinked experimental-analytical problems that genomics approaches involve. There are no prerequistes, but a fundamental understanding in molecular biology and biochemistry is highly recommended. 4 credits. MICROBIO 680 Microbial Physiology (Fall). Main aspects of microbial growth, energy and biosynthesis pathways, metabolic regulation and integration of pathways into a coherent system. Emphasis on physiological diversity, global control systems governing the adaptation of microorganisms to different environmental conditions, and emerging methodologies. Prerequisite: general background in microbiology and biochemistry. 3 credits. MICROBIO 697D Special Topics: Acid Mine Drainage. Critical reviews and discussions of the current literature dealing with biogeochemistry of acid mine drainage (AMD). Establishes a broad understanding of the current literature and the basics of the biogeochemistry of AMD, and the biogeochemical processes related to AMD production and attenuation. AMD studied as a model for the interaction of microbial, geological, and hydrochemical systems. 1 credit. MICROBIO 699 Master's Thesis. 1-9 credits. MICROBIO 791A Graduate Seminar. Reports and discussion of pertinent literature and research. Required of all microbiology graduate majors each semester in residence. 1 credit. MICROBIO 796 Independent study. Research project under direction of a faculty member. By arrangement. 1-8 credits. MICROBIO 797J Immunology Journal Club. Critical review of the scientific literature is an integral part of scientific research and both students and faculty benefit greatly from the discussions originating from these reviews. Immunology Journal Club meets Fridays at 12:20 PM in Paige Labs, room 214. Typically one paper is presented by a student at each meeting. Auditors are always welcome. Grading is pass/fail. Registered students are expected to make one presentation and to attend all meetings. Students presenting are expected to make their own selection from the literature (see below), but are welcome to consult one of the immunology faculty for advice. In most semesters, papers are presented from any area of immunology. In some semesters, the faculty restricts the papers presented to a specific topic. During recent years, such topics were programmed cell death, virus immunology, and receptor-mediated signaling. Papers for presentation are to be selected from the following top-ranking journals: Cell, Immunity, Nature Immunology, Nature, Journal of Experimental Medicine, Journal of Virology, Proceedings of the National Academy of Sciences USA, or Science. Papers from other journals can be presented with prior approval of a faculty member. 1 credit. MICROBIO 797P Molecular Mechanisms in Pathogenesis. Bacterial, protozoan, fungal, and viral pathogens have evolved a wide variety of mechanisms to establish themselves in the host and gain nutrients, subsequently causing host cell damage and disease. Other mechanisms of pathogenesis include host defense evasion. We will explore some of the complex processes used by microbial pathogens through current primary literature. A discussion of the modern molecular biology, genetics, and biochemistry tools to study these processes will be incorporated. Understanding how microbes cause disease is often the first step toward the development of new therapeutic approaches. 1 credit. MICROBIO 899 Doctoral Dissertation. 1-9 credits. A committee meeting should cover the time period from the last committee meeting, and include plans until the next committee meeting. To enable guidance, the candidate is encouraged to start with a presentation that includes an outline of the proposed thesis, followed by a summary of recent work and detailed interpretation of the work (e.g. publication ready graphs and tables), and an outline of future work which include a list of planned manuscripts. The future plans for the next six months of research following the committee meeting should be described in greater detail, and the candidate should present the committee also with a detailed outline of the next manuscript and a timeline for its submission. Meeting styles and length vary depending on the participants. Usually, meetings last from one to two hours. The presentation is followed by a Q&A session, a detailed discussion of the presented results and their interpretation, and a discussion of the next steps to be taken in this research project. Dissertation Prospectus Signed by Committee & Turned in to the Graduate School (copy of signed cover page submitted to Department of Microbiology Office). There is a seven month waiting period between submission of prospectus and final doctoral oral examination. least 4 weeks prior to defense. Provide date, time and title.